Me too. Although I actually use both, and in my head they mean slightly different things. Grey is soft and gentle. Gray is flat and dull, like matte paint. Yeah, I like grey too. I’m American but have always felt that “grey” has a connotation of bleakness that “gray” does not. In particular, I always spell it “grey” when complaining about the weather. I find it interesting that not only do a lot of Americans prefer grey, bu they actually differentiate between the two spellings in some way—myself included. I have this notion that gray is paler than grey. I have no idea where I got it from, and I recognize that it’s an idiosyncrasy, but why do so many others have similar idiosyncrasies? And it’s possible that the growth of gray is at least partly a result of references to the Civil War, but that still doesn’t explain why that particular spelling became associated with CSA uniforms. I still suspect that Webster’s dictionary is a large part of it, though obviously I’d have to do some more research. I agree that the feedback loop probably has a great deal to do with it. We as a people tend to think the dictionary is a standard and exemplar, so if “gray” is first it must be “right(er)”. Oddly, I think of “grey”as lighter and prettier than “gray”, unlike some others here. But I must question the notion that Webster had any value-neutral judgements. For him, if “grey” was perceived as British, that would have been more than reason enough to get rid of it. I think we’ll all agree that the discussion about relative shades of “grey” vs “gray” is strictly a psycholinguistic claim as opposed to a semantic claim. They mean exactly the same thing, but they might conjure up different images by default in the mind’s eye. I’ve seen linguists try to “debunk the myth” that grey and gray mean different things, and have to wonder whether they’re simply mistaking a psycholinguistic claim for a semantic one. Definitely in the “gray sounds darker” camp here. I never spell it that way myself (I’m not American), but that’s what I picture when I read it. Light, white, yellow, dark, black: these words would suggest that letters associated with more open vowels are correlated with darker colours, so I feel my instinct is justified. It has been said that everyone is slightly synaesthetic, and I’m inclined to agree. Perhaps we envision distinct shades of grey/gray by the context of literature, such as I have shown above. If one writer uses the word gray to describe a dark, cloudy day, we log that image into our minds as an adjunct definition. If another writer speaks of the velvety soft grey coat of a kitten, then we now have a different image and thus a different definition and spelling of the word. Adrian: I like the “everyone is slightly synaesthetic” argument myself. And in some ways sound symbolism is a language universal or at least a near-universal, with certain types of sounds corresponding to certain ideas across the world. I think it’s interesting that in this case those sound symbols may have been transferred to their graphic representations, even though in this caes those two letters represent the same sound. DebWa: I doubt that King James intended a distinction there. As I understand it, a veritable army of translators was working on the KJV, so it shouldn’t be surprising that there are at least minor variations like that. Webster’s method was pretty arbitrary from what I understand… He chose certain ways to spell things (“humor” v. “humour”) and threw in other words as well–the point was to distinguish America’s language from Britain’s and, generally, to standardize the language. The dictionary _>_ the MLA Handbook… in my eyes, anyway. P. S. Supposedly, “supposebly” is on the rise. 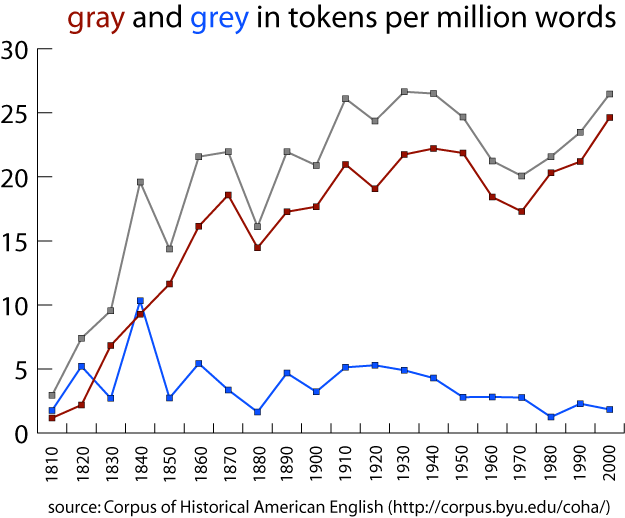 Could it be that “gray” was a result of Webster’s effort to push a new, Americanized version of the word? The guy sure seemed to like to do that. What’s the point of having two spellings for the same color? Certainly neither “bloo” nor “perpul” would fly these days, even if you did try to argue that “blue” is a prettier, more precious color and “bloo” is darker and harsher, or some nonsense like that. Anyway, I’m an American, so, in accordance with my patriotic duty, I dislike “grey.” It’s ugly (the word, not the color). It’s certainly a possibility, though I don’t know if there’s any evidence that Webster deliberately introduced the spelling as an Americanism.